Clickers are used to gain student involvement in even the largest classrooms. At Stony Brook University, a lot of our instructors will assign points to the students whether they get the question right or not. Sometimes the same amount of points, sometimes not – and sometimes those grades make it to the grade book and sometimes, they only measure whether the students were responsive enough to merit attendance for the day. So what does it mean if the results manager shows a 0 in the situation where the instructor gives points whether the students got the answers wrong or not? First, make sure that the instructor marked something as correct. If most students have a grade of some sort – but one or two students have zeros across the board, this isn’t likely the issue. 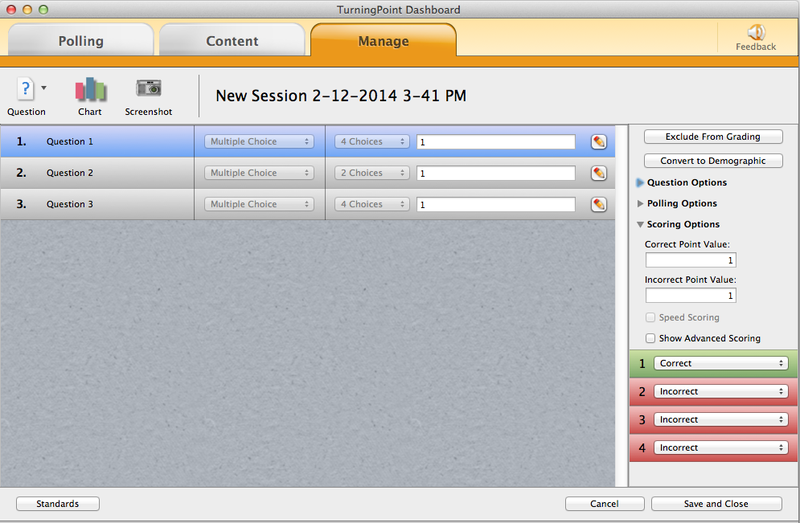 You can double check that something was marked as correct, by going to the Turningpoint Manage tab selecting a session, and clicking Edit Session. In the above picture you can see that answer 1 is marked correct and that both incorrect and correct answers would get a value of 1. So this doesn’t account for the 0 in the results manager or grade book. The next thing that could be wrong, could be that the student unwittingly was in “Send Message” mode, rather than just in the regular polling mode. To find out if this is the case, go to Manage tab, then while having a session highlighted, click the Reports button. 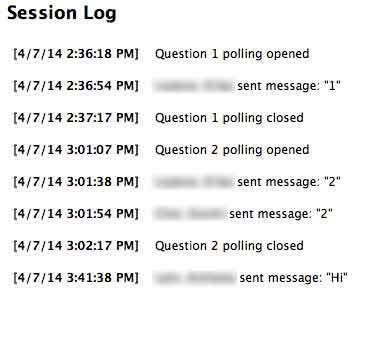 However, you can also see that two students were sending in what they thought were answers to the polls. If these students have zeros – you now know why.